After the British evacuated Boston on March 17, 1776, Gen. George Washington guessed correctly that their next target would be New York. By mid-April, Washington had marched his 19,000 soldiers to Lower Manhattan. He strengthened the batteries that guarded the harbor and constructed forts in northern Manhattan and on Brooklyn Heights across the East River on Long Island. On August 22, 1776, Gen. William Howe’s large fleet and 34,000 army troops landed on Long Island, hoping to capture New York City and gain control of the Hudson River, a victory that would divide the rebellious colonies in half. Gen. Howe halted the fighting by the early afternoon and directed his men to dig trenches around the American position on the next day. Before they could be surrounded, Washington ordered his men to evacuate Long Island. From late in the evening of August 29 to dawn on the following morning, Washington watched as 9,000 Continentals were rowed back to Manhattan. As the sun came up, a fog miraculously descended on the remaining men crossing the river. According to eyewitnesses, George Washington was the last man to leave Brooklyn. 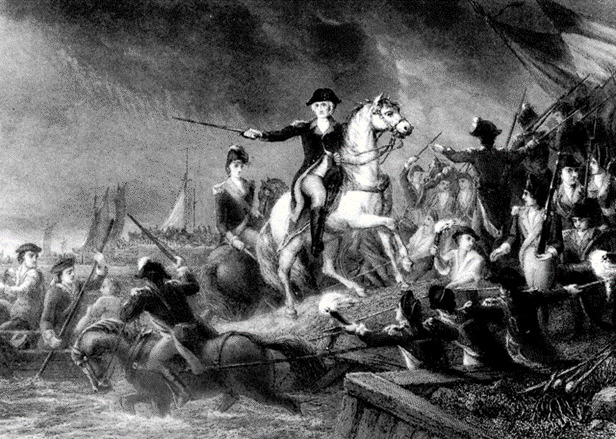 At the Battle of Brooklyn, the Americans suffered 1,000 casualties to the British loss of only 400 men. Militarily, the British were now in control of New York City. During their occupation, British forces captured or arrested thousands of soldiers and civilians, some after battles fought around New York and some for simply refusing to swear allegiance to the Crown. In addition, the Continental government had authorized a number of privately owned, armed ships to serve on behalf of the patriotic cause; some 55,000 American seamen would eventually serve as merchant marines or privateers. Whenever the British captured these privateers, they gave them the choice of joining the Royal Navy or going to prison. Most ended up in prison. The problem was, management and treatment of prisoners of war were very different from the standards of modern warfare. Modern standards, as outlined in the Geneva Conventions of later centuries, expect captive to be held and cared for by their captors. The primary difference in the 18th century was the care and supplies for captives were expected to be provided by their own combatants or private citizens. King George III of Great Britain had declared American forces traitor in 19775, which denied them prisoner of war status. However, British strategy during the early conflict included the pursuit of a negotiated settlement allowing officials to decline to try and/or hang them – the usual procedure for treason to avoid unnecessarily risking any public sympathy the British might have enjoyed in the Americas. Great Britain’s neglect resulted in starvation and disease. Despite the lack of formal executions, neglect achieved the same results as hanging. American prisoners of war tended to be accumulated at large sites that the British were able to occupy for long periods of time. New York City, Philadelphia in 1777, and Charleston, South Carolina, were all major cities used to detain American prisoners of war. Facilities at these places were limited. At times, the occupying army was actually larger than the total civilian population. Other American prisoners were housed in other parts of the British Empire. Over 100 prisoners were employed as slave laborers in coal mines in Cape Breton, Nova Scotia – they later chose to join the British Navy to secure their freedom. Other American prisoners were kept in England (Portsmouth, Plymouth, Liverpool, Deal, and Weymouth), Ireland, and Antigua. 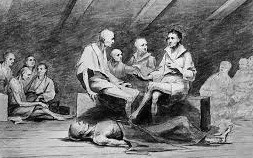 By late 1782 England and Ireland housed over 1,000 American prisoners, who in 1783 were moved to France prior to their eventual release. Space in British jails on land soon ran out, and the British began housing prisoners aboard the abandoned or decommissioned warships anchored in Wallabout Bay, the small part of Upper New York Bay located along the northwest shore of the city of Brooklyn between the present-day Williamsburg and Manhattan Bridge. As a result, the most horrific struggle of the American Revolution occurred just 100 yards off New York, where more men and boys died aboard a rotting prison ship were lost to combat during the entirety of the war. The first ships used by the British to hold prisoners were originally transports in which cattle and other stores were carried across the Atlantic. 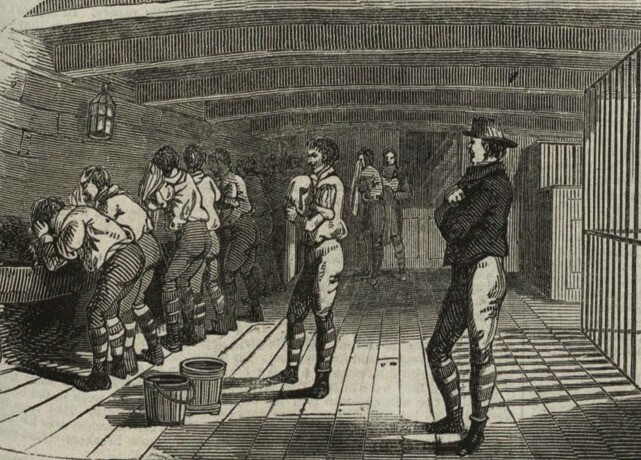 The first prison ship was the “Whitby.” The captives aboard were allowed to keep their clothing and bedding but received no more of such commodities while on the ship. They were given no medical attention. The rations they received were either cut or substituted with unwholesome meat by corrupt British commissaries. The men aboard the “Whitby,” seeing no hope for an exchange, set fire to their ship in October 1777, choosing death in the flames to lingering sufferings of disease and starvation. The burning of the “Whitby” and others like it did not bring the prison ships to an end. 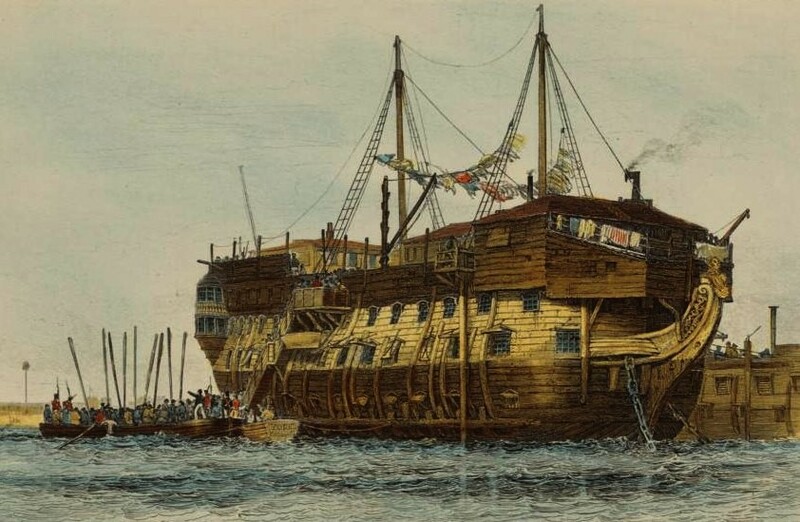 The most infamous of the prison ships was the HMS Jersey or “Jersey” which was an old converted sixty-four-gun man-of-war, stripped of all its fittings except for the flagstaff. Every three days, rations would be given out to a six-man mess. On certain days, men were not allowed to cook fires and had to wait another twenty-four hours or consume their meat raw. Having no fruit or fresh vegetables, scurvy was naturally one of the diseases that afflicted the prisoners. The “Jersey” had on board anywhere from 400 to 1200 prisoners. Conditions on board were beyond despicable. Meager rations of maggoty bread and rotted meat left the prisoners sick, weak, and emaciated. With no toilets to speak of, excrement piled up as thousands of men and boys were packed into the ship’s dark, dank interior. Occasionally, groups of prisoners would escape overboard, only to be recaptured on British-held Long Island. As years slipped by on the Jersey, life became unbearable: unable to wash but with salt water, their skin turned sallow and hung over their skeletal bodies like old parchment. All thought was consumed by plans for escape, when not distracted by want of food or drink. By 1780, prisoners were dying aboard the Jersey at a rate of roughly ten each day. At least, that’s how many bodies were unloaded from the ship every morning at 8 am. Corpses were brought up to the top deck as they were discovered, and left there until morning when they were piled onto a wooden plank and lowered over the ship’s side to be buried in shallow pits on the sandy banks of Wallabout Bay. Sometimes, bodies would go weeks before being discovered, so dark were the prisoners’ quarters. The air was reportedly so foul that no flame would stay lit. 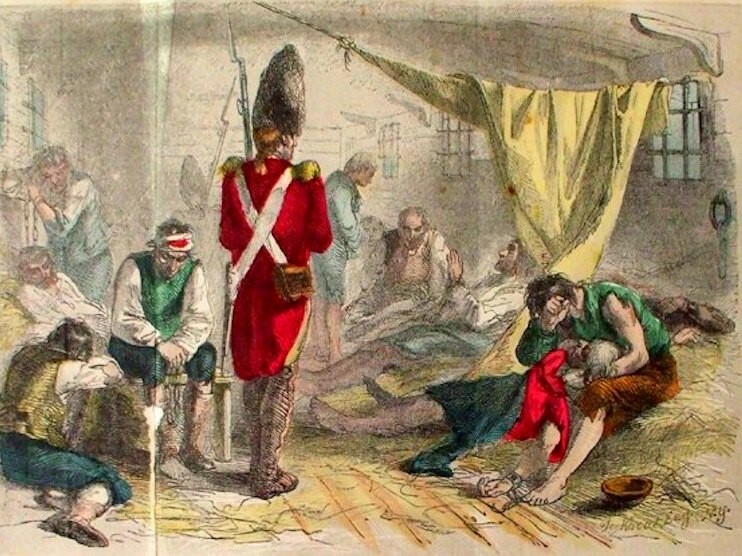 More than 1,000 men were kept aboard the Jersey at any one time, and about a dozen died every night from diseases such as small pox, dysentery, typhoid and yellow fever, as well as from the effects of starvation and torture. Even after the British surrender at Yorktown in late 1781, prisoners were kept aboard the Jersey and other ships until the war formally ended in 1783. At war’s end, there were only 1,400 survivors among the inmates of the entire prison ship fleet, and at least 11,000 men and boys died aboard the ships from 1776 to 1783 – more than lost to combat (6,800) during the entirety of the war. The corpses of the dead were often tossed overboard, though sometimes they were buried in shallow graves along the eroding shoreline. Many of the remains became exposed or were washed up and recovered by local residents over the years. Throughout the colonies, the mere mention of the ship sparked fear and loathing of British troops. It also sparked a backlash of outrage as newspapers everywhere described the horrors on board the ghostly ship. This shocking event, much like the better-known Boston Massacre before it, ended up rallying public support for the war. In the years following the Revolution’s conclusion, daily tides uncovered a seemingly countless number of skulls and bones on the shores surrounding Wallabout Bay. Skulls were said to litter the beaches as thick as a pumpkin patch, and children would kick them about like a ball. As Brooklynites collected more and more of the bones, calls began to ring out for a more respectful and honorable resting place for these most neglected of Patriots. As a result, in 1808, a crypt was constructed near the bay for the skeletal remains, almost none of which could be identified. There they would rest in relative peace for another century. During that century, arguments waxed and waned regarding the construction of a more fitting memorial to these glorious dead. The flame of patriotism was fanned, funds were raised, and in 1908, on a hilltop overlooking the bay where so many thousands of tales of misery were played out, a monument was erected to the Prison Ship Martyrs. Beneath the 100 steps leading to the soaring memorial column was constructed a spacious crypt. Twenty slate boxes filled with the bones of the deceased thousands were placed in the crypt and sealed behind a bronze door. Twenty-thousand New Yorkers and other dignitaries turned out on a cold, rainy November day to dedicate the memorial. But time has a way of erasing memories. 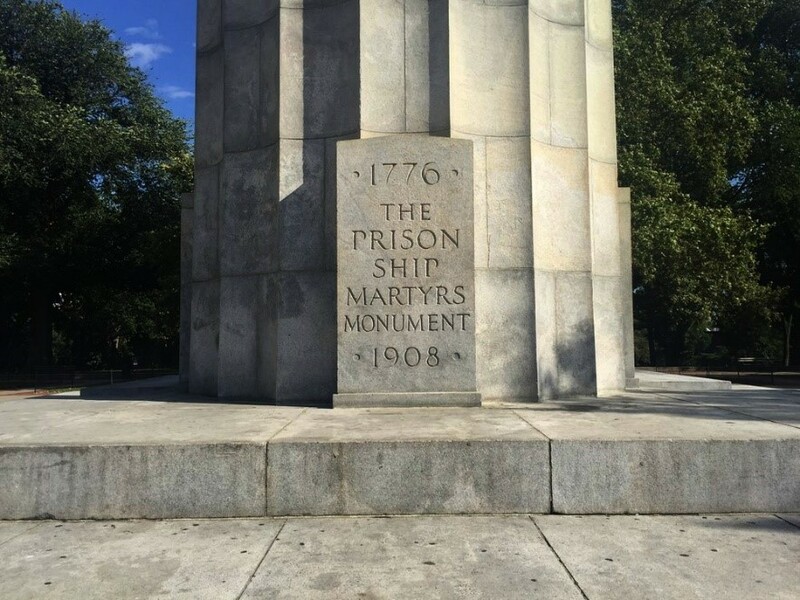 As New York’s fortunes ebbed in the later decades of the 20th century, so too did the fate of the Prison Ship Martyrs Monument. A staircase and elevator which once ferried visitors to the column’s pinnacle were both removed in 1945. Vandals marred its base with graffiti and in 1966, the monument’s four large bronze eagles were removed to be restored, never to return (two remain in storage and two are on display at the armory in Central Park). As New York has gone through a bit of a renaissance in the past several years, the Martyrs Monument has not been entirely forgotten. Between 2006 and 2008, more than $5,000,000 was spent to restore the column and its surrounding plaza. Despite its restoration, however, the thousands who perished here and whose bones lie beneath our feet remain largely ignored by modern generations. In 2008, in celebration of the memorial’s centennial, only 200 people turned out in the park. Compare that to the 20,000 who flocked there in the rain a century before. These men walked and fought alongside George Washington. They suffered and died in the name of American independence. They endured untold indignities, even in death. And this largely-forgotten memorial atop a hill in Fort Greene Park is among the most hallowed ground in this nation. We owe everything we have today to the ideals these men held so dear. And we owe them our respect and an immense debt of gratitude.